Peter Ray, MD with a patient. When you think of plastic surgery, nips and tucks to hide the sags and wrinkles of aging faces may be the first thought that comes to mind. However, in pediatric plastic surgery, the focus is on helping young people face the future confidently so they can live their lives feeling more comfortable in their skin. According to Ray, pediatric plastic surgery is not so much a specialty as it is a calling. Beyond the years studying to become a physician, and advanced training developing the skills of a plastic surgeon, becoming adept in this highly specialized field requires additional time learning the nuances of care specific to growing children. 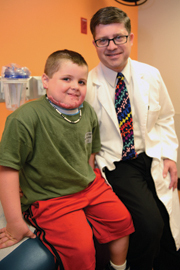 Pediatric plastic surgeons are so rare, in fact, that Ray and his Children’s Hospital colleague John Grant, MD, are the only two surgeons practicing this specialty in the Birmingham area and they care for patients referred to them from across the region. Ray also emphasizes the value of having the support of care teams at Children’s Hospital who are experienced in working with young patients. Ray says the first priorities are preserving life and function. Restoring appearance to help children look as normal as possible is the next step. “At first, younger children are usually just curious if someone is different. As they get older, they start comparing themselves to each other. Gradually a pecking order develops, and looking different can have a negative effect on a child’s self-image that can affect him long term if it isn’t corrected,” Ray said. “The functional surgeries may involve freeing a stricture or a burned finger so it can be used more normally. Sometimes we redo surgeries to reduce scarring on the face or anywhere on the body. Some corrections have to be done with a series of procedures as children grow,” Ray said. For Ray, the road to becoming a pediatric plastic surgeon began in Bosnia and Afghanistan, where he commanded a forward surgical team. “When we weren’t dealing with war injuries, we helped out locally in areas where there weren’t robust hospitals. We didn’t want to disrupt local medicine, but to support them. As a combat surgeon, you work in all kinds of conditions and learn techniques to deal with just about anything from head to toe. You learn to figure out what is needed and how to be creative in filling the gap. Ray was interviewed on the 4th of July, a weekend he spends on call every year at Children’s Hospital to be ready for holiday related traumas that might come in. Ray says one serious problem that needs more awareness is lawn mower injuries. Ray says it’s also important to think like a kid when child-proofing a home, especially when children are at that dangerous climbing age. When children are sick or injured, it can be tough to be the adult in the room. “Sometimes it seems harder on parents and caregivers. Kids are inspiring and resilient. Kids power through.” Ray said.